After more than a decade of bikepacking adventures, Jay Petervary is something of a guru. We asked for his advice on getting out there. You can call Jay Petervary a legend, or a pioneer. He simply calls himself a bikepacking ambassador. Petervary has completed the Iditabike 10 times, the Tour Divide six times (he once held the time record), and Dirty Kanza 200 four times, and that’s just the beginning of his exploits. VeloNews caught up with Petervary before he hopped on a flight to Kyrgyzstan to take part in the inaugural Silk Road Mountain Race, which winds 1,100 miles through some of the most remote landscapes he’s ever encountered. “I haven’t been this nervous for an event in a long time,” Petervary said. He ended up winning that epic trek in eight days, eight hours, and about 15 minutes. Your bikepacking trip doesn’t have to be that ambitious, but Petervary has plenty of good advice for any adventure. 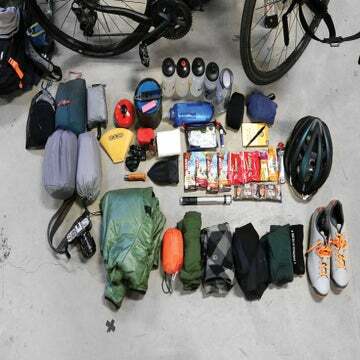 VeloNews: How long have you been bikepacking in one form or another? Jay Petervary: I first started bikepacking in 2006. That was driven by a goal to do the Great Divide mountain bike race. It’s called the Tour Divide now. I’ve always been a multi-day racer, but also multi-discipline. I did adventure racing when I was 22, and now I’m 46. The bike is my favorite discipline, and I was always good at getting through the bush and bushwhacking with my bike, so when I saw I could do it solo, I wanted to try it. I came back from that trip in 2007, and it was the best thing of my life. I called it the “cheeseburger and ice cream tour” because that’s all I ate. Honestly, I didn’t even realize I was setting a record. I finished the event finding a passion I really loved, and when it was over I was told I set a record by 24 hours. So, I realized I was good at this as well. But I found something I loved, and I’ve been chasing it ever since. I’m probably pushing close to 40 or 50 bikepacking races that last up to three weeks long. VN: When you started, what did your gear setup look like? JP: I was way ahead of my time. I was the first one to show up with a soft bag system—frame bag, seat bag, handlebar bag. No one had seen that before. Carousel Design Works worked with me on that kit. I was actually racing a 29er at the time, which was the very first production carbon 29er, only in size medium, made by Orbea. There was no other out there. I had aero bars as well. It’s funny for me to look at that bike now. It was a slicker, neater setup than what I use now. I also had a double stem: I had one stem that supported my handlebar, and then I had a direct mount stem above it. It wasn’t a long stem; it was from the downhill world. On it, I put a dummy bar because I found in my testing that with the aero bars, the stretch was too long. So I said, I need to move these back. People geeked out over that. Now there’s a product like it called the Fred Bar from Siren. I’ve always been a gear guy, and I like to make things. But I’m also big on strategy. I like to figure out other ways to play the game other than just pedaling with my legs. If I can beat it with equipment, I’ll beat it with equipment. VN: How has your gear setup changed since then? The biggest change is probably drop bars. Drop-bar mountain bikes are the big thing now, and now I run strictly drop bars. The adventure style bars have been a real gamechanger. I’m not going back to my old flat bars. Tire size is important, too. In the last Tour Divide, I ran a 42-millimeter tire in the rear for mud clearance. With the growth of gravel and adventure riding, wheels, wheel size, shape, tire construction, tire size, is now changing all that. Everyone was like, “You gotta run 2.2-inch tires.” But the last couple years I’ve been doing off-road races on 42-millimeter tires [1.65 inches]. Water has been a progression of learning, too. I had upwards of 15 pounds of water on my back when I first started. Now I do Tour Divide with two or three water bottles and a can of pop. It’s what my body’s capable of and I’m comfortable with that amount of water. I’m okay to run out of water 20 miles before the next water stop because I know I can go 20 miles without water. I don’t use bladders at all now. Bladders just take too much time to fill. If I need extra water I can always buy it from a store and put it in my pockets. VN: Of all the equipment you own, what’s the one thing you will never leave at home, regardless of the duration of your trip? Rain gear. I skimp on a lot of things. I don’t always bring a sleeping bag or sleeping kit. But I’ll always bring my rain gear no matter how long the ride is. Even if it’s sunny on a day ride, I can’t leave my house without a rain jacket. That comes with age and being wise. It’s like, “Dude, just bring it, trust me.” You learn that one the hard way. VN: What’s one thing you’d recommend consumers don’t waste their money on? JP: As the sport grows, people are getting gear-happy. They don’t know the meaning behind it. People are wasting their money on the lightest gear possible, and they don’t know what that provides for them. Use what you have at your house before you buy anything because the lightest equipment isn’t always the best. People often sacrifice comfort that they don’t want to sacrifice. I recommend being cautious and understand when you do put your money toward an expensive and lightweight piece of gear, lightweight is not always the answer. VN: What’s your most important advice for someone interested in trying bikepacking? JP: Do it for you. Don’t do it because you see racers doing it and you want to be a dot on a screen. Use what’s available to you in your garage. Most outdoorspeople have the stuff, but people want to buy more stuff for some reason. There’s a lot to learn if you just use what you have. Back in the day, we just strapped everything to the bike. So if you really want to do it, you’ll make it happen. Take what you read on the internet with a grain of salt. Also, to have an experience, you don’t have to ride a lot of miles. I used to do this a lot: I would roll out of my house after dinner and go to the local campground. I’d have a full-on experience using my stuff and go to work the next day. And that’s pretty darn healthy. People relate this to the racing, which is kind of a bummer, and people think they need a lot of miles. That’s just the wrong approach.